Government Bank Job Circular published for the post of Cash Office 2017. Bankers Selection Committee published a news job circular at erecruitment.bb.org.bd for the post of Officer (Cash). Four bank named Sonali Bank Limited (SBL), Janata Bank Limited (JBL),Bangladesh Development Bank Limited (BDBL) and Bangladesh Krishi Bank (BKB) will recruit 2246 persons. CGPA Calculation: See image below. In the application procedure you must have passport size photograph & signature of Scanned or Digital print. Required dimension of photograph is 600×600 pixel. Applicant must mention result publication date of all examination. Applicant should save/print Job Tracking Number Page after online application for future use. Don’t forget to save / store applicant copy after submission of application. It will be helpful for you during downloading admit card. Before application, make a choice list of your own. Remember if any candidates create duplicate CV or provide wrong information in the application form, their application will be rejected without any prior communication. 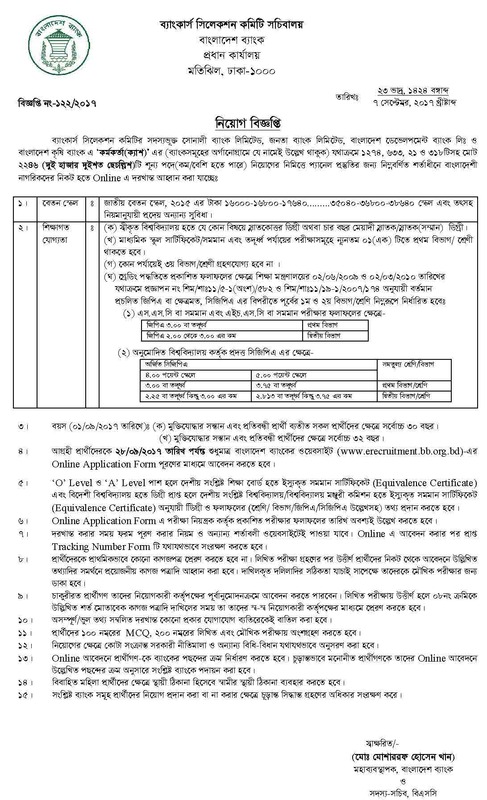 Please share this job with your friends and stay with our website www.careerguidebd.com for further information i.e admit card download notice, examination schedule, seat plan, job preparation guideline and all kind of job circular and job notice. And don’t forget to like our Facebook page for update information. If you have any question regarding this job circular, you can ask below. And don’t forget to share this huge job circular with your friend.